I wouldn’t say I’m obsessed with it but reviewing my iPhone photos from the past week, it looks as though I have a little obsession with Toronto’s CN Tower. Soon I’ll share how it scared and just about conquered me but for now, enjoy these snapshots. 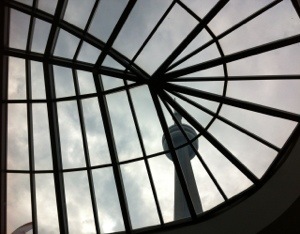 Above is a view of the tower as viewed from the Metro Toronto Convention Center. 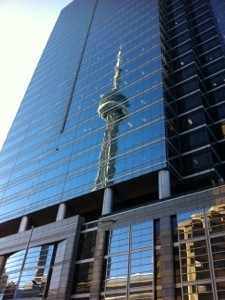 When you travel to Toronto, it’s hard to miss this prominent building. 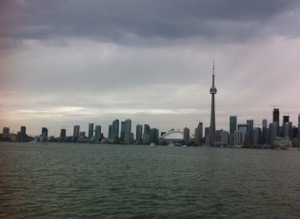 The photos above and below were taken from Centre Island, accessible by a passenger ferry. 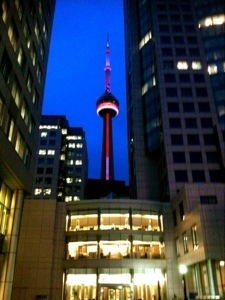 The CN Tower just pops with color at night. 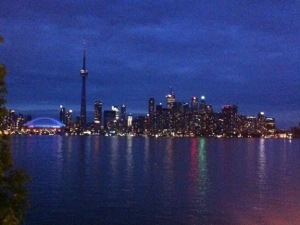 Not only did I see it in Toronto’s skyline but I saw it in the reflections of buildings, too. The tower was my beacon and used it to navigate my way from the conference center to my hotel, Hilton Garden Inn Toronto Downtown. 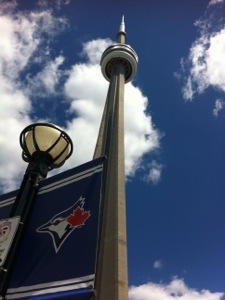 In addition to being next to the convention center it’s next to the Rogers Centre, home of the Toronto Blue Jays. 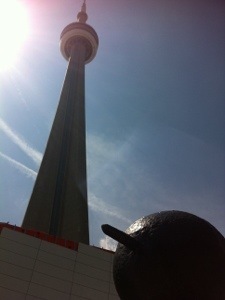 I loved the sculpture of a snowman and was delighted to incorporate it into a shot with the CN Tower. 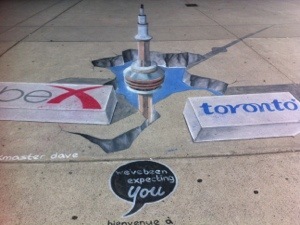 The coolest view of the CN Tower was this 3D chalk painting by artist Chalkmaster Dave which was created specifically for TBEX, the Travel Blog Exchange Conference I attended and reason I was in Toronto. 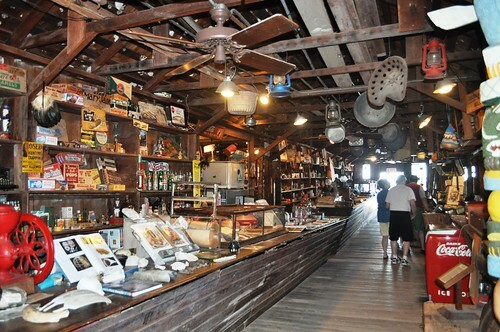 Pretty nifty, eh?